Same dress in a different print/color: here and here / also wore this dress on our honeymoon! 37 weeks and feeling like I’m about to pop. I had so much energy in my third trimester and then the 37th week arrived and it all totally went out the window! I’m so achey and I truly do feel like he is going to come out at any minute! It’s like he is in there planning his escape route—checking out every single space he has and punching it to see if he can get out. At 35 weeks, I was already 75% effaced. At 36 weeks, I was also 1cm dilated. Today is my 37 week appointment, so we’ll soon see how much more ready my body is for this baby! I’ve had some big contractions, but they’ve just been sporadic and not in any sort of pattern. Sleeping has been a big joke, but I’m so thankful that this is the first full week that I’ve had that problem. I just can’t get comfortable. But it’s all worth it! Just so ready to get this show on the road and snuggle my baby. Other than that, nesting has been in full force! I’ve organized almost every item to my name, cleaned every hairbrush and makeup brush (why? ), cleaned everything from the window sills and baseboards to the inside of our cabinets, and made an accordion file full of our family information from medical, to home, to kitty boy stuff, etc. Brandon has been the biggest champ and has washed every single washable baby item, as well as every other linen in this house. And this is just some of it… I would love to know what all of you mommas did during your “nesting” phase! I’ve heard some funny stories. I still have a list of things I want to do, but I’m getting a little worn out, so we’ll see how that goes. Oh, and our hospital bags are packed and the carseat is installed! I am definitely planning on doing a blog post about what I’ve packed in our bags. You all were so helpful with that on instagram! 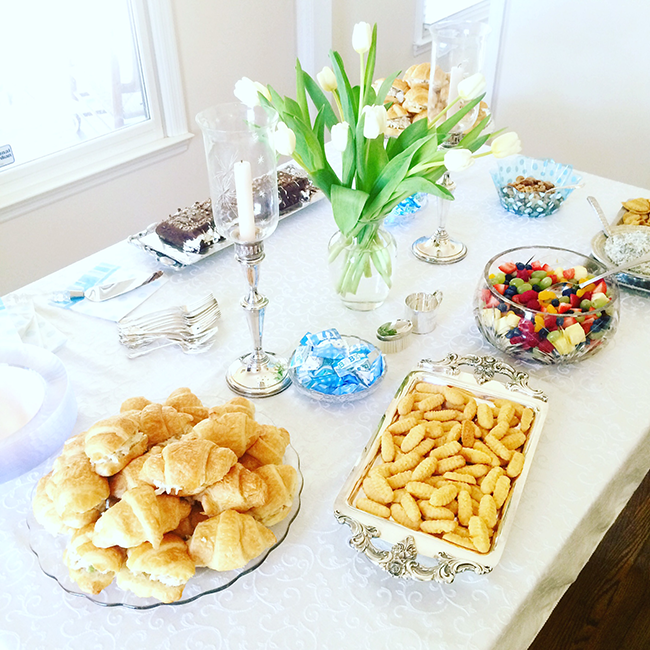 Just realizing I may not have shared this in a baby update, but here’s a photo of the beautiful table set up that was at my baby shower Brandon’s cousin, Shelly, and Aunt Retta hosted for me. Everything was so special and the company was fantastic! We were showered with so much love and we can’t wait for everyone to meet our baby! Also, I thought it might be fun to share some new baby gear I’m so excited to use! I was a very picky person when it came to choosing the nursery glider. It had to be white with a washable cover. It had to have a high enough back so that my head could rest on it during late nights rocking our baby. It needed to be large enough so that it felt roomy, but not so huge that it took up the entire room. And I really wanted one that had a unique shape. See, I told you I was picky. I was really starting to get discouraged on the whole glider search after looking high and low for one that had every single bit of criteria above. I was failing miserably and growing worried because most gliders take 10-12 weeks to come in. I pretty much resorted to buying one that I wasn’t totally sold on, but then I walked into Celadon. The glider I have pictured below was literally sitting by the front door staring at me when I entered the store and I fell in love with it immediately. It’s called the Patti Glider and it’s perfect in every way. Of course, by the time we went back, it had been sold, but Celadon was able to special order this one for me and it came in with plenty of time to spare. You know, I hadn’t really thought of looking for a glider at Celadon, but they have so many styles—although I’ve learned that they sell quickly! 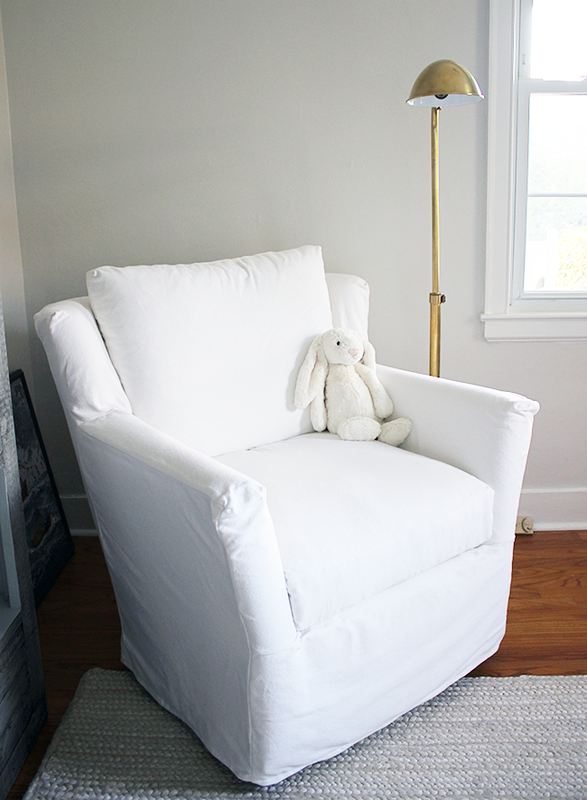 So if you’re local to Charleston and a new mom (or just love a swivel chair in general), definitely check them out. They saved the day for me …majorly. I’ve heard rave reviews over this thing and cannot wait for W to lay in his. 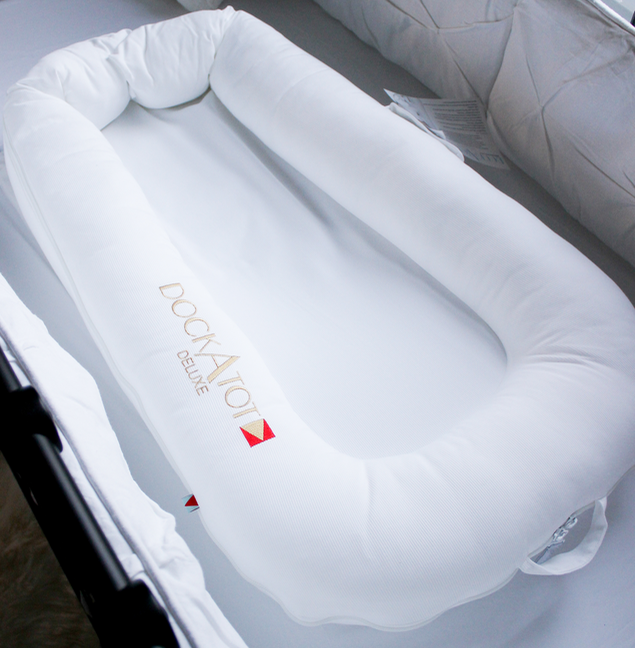 The DockATot is a comfy lounging dock for little ones ages 0-36 months. You may notice that ours is in the crib and please know it is not made to be used in a crib or bassinet, but it’s a convenient place for ours to be stored in the meantime. It’s created for safe co-sleeping, supervised tummy time, play time, snuggle time, supervised naps, as a changing station, or really just any time you need to put baby down in a comforting spot. I’ve heard this is a game changer when it comes to getting your baby to sleep because the contours of it mimic the feeling babies have in the womb. As soon as I found out I was pregnant, I knew I had to have one of these. (And thanks, Baby, for coming in perfect time for their new spring collection!) Check out the Solly Baby Instagram and all of you mommas will be obsessed, too. I can’t wait to share photos of these in action, but here’s my Solly supply below—the natural & grey stripes wrap, the sky wrap, and this swaddle set (which happens to be the softest material I’ve ever laid my hands on—and you can completely customize which two colors you would like). I mentioned wanting one of these in this post last fall, so this has also been a long time coming! I chose the grey and white stripes because it will go with pretty much everything. 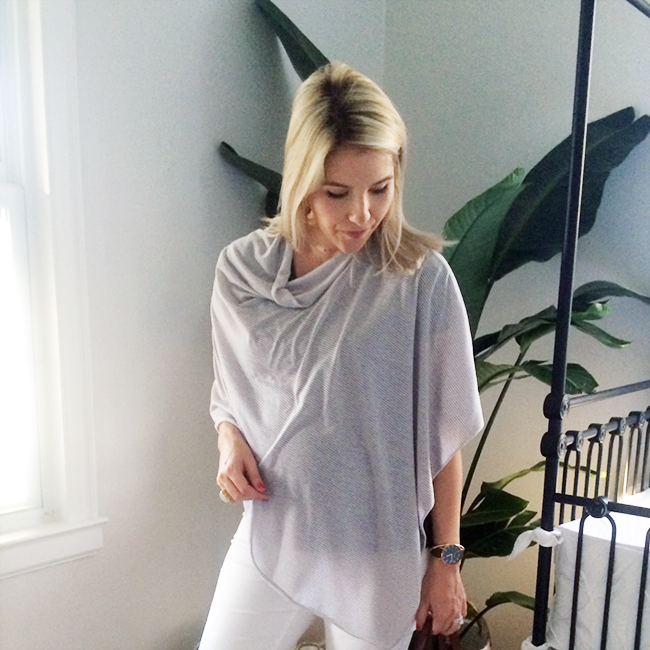 This is not just a nursing cover, but also could be worn as a scarf, used as a carseat/stroller cover, or just wear it as a poncho like I’m wearing it below. Who is your dress by in the first photo – it's beautiful! Megan!!! You're so close!! 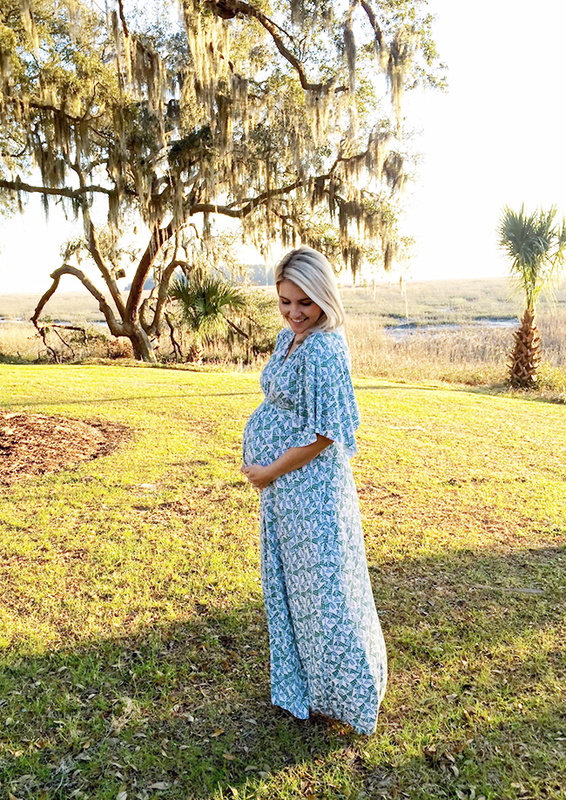 Last year when I was expecting my daughter, I was 80% effaced and 2cm at my 37 week appointment, and ended up water breaking and going into labor by 38wk+1day. Ahhhh — so excited for you!!!!! Nesting is such a funny compulsion, isn't it? I kind of wish mine had sunk in months earlier (I could've gotten so much done! ), but I was scrubbing windows the hour before my baby shower / color-coded and size-arranged baby's closet / frantically rearranging my DropBox folders / cleaning our mailbox / vacuuming like a fiend in the weeks before Lilly came. We also went to Home Depot a LOT and got a bunch of palms and plants to put around the house. And painted our front door yellow. It certainly is motivating to get home projects done! I love your glider! So glad you found the perfect one. I'm still so grateful for ours, and for all of Lilly's nursery fixin's — I was thinking about that last night. Even though she slept in our bedroom until 4 months and we didn't use certain things until later on, I'm so grateful for them now. And it's amazing how fast a year goes by! Cannot believe I'm planning a first birthday party for next month (!!!). Enjoy every last little moment of being pregnant! It definitely gets SO uncomfortable and nothing compares to the joy of having your baby in arms at long last, but I was shocked at how much I missed being pregnant, even just six weeks postpartum. (You also may be shocked at how quickly you forget the uncomfortable parts – yikes! Although my other mom friends say they have NO issue remembering… to each, their own!) This is the most exciting part! You're in the final stages! Enjoy every last second of holding your baby 24/7, keeping him safe and close by you, not having to share him. And then soak up all that new baby goodness — you are in for something so incredible!!!!! Praying for an easy fast delivery, quick healing and recovery, and an insanely joyful first year (and on) with your new little one!!!!!!!! Love the lamp by the glider! Would you mind sharing the source? Thanks! Enjoy these last few weeks! As much as you're over being pregnant and just want the baby in your arms, this is the last time it'll just be the two of you. I really missed being pregnant and still do sometimes even 5 months out. I missed seeing my dr every week as silly as that is and the build up. Not that having the actual baby wasn't enough excitement! I carried Oliver in a wrap for the first few months daily. It was the only way I could get anything done! You are so cute! I'm a ways behind you at 28 weeks with my second. I'm interested in the dock a tot too and I lovveee that Rachel pally dress! Part of my whacky nesting involved scouting and scouring the Internet for hard to find Lilly Pulitzer coffee mugs!! I decided that when friends and family came to meet our daughter, they should drink from Lilly mugs because they were happy & spring colored!! Ha!! I found 4!! Coffee was had in happy style!! I've loved following your pregnancy, I'm 34 weeks, so it's been fun to read an compare. Your nursery is beautiful! Best of luck these last few weeks, enjoy!